BEAULIEU TAPESTRY for only $46.99 in online liquor store. 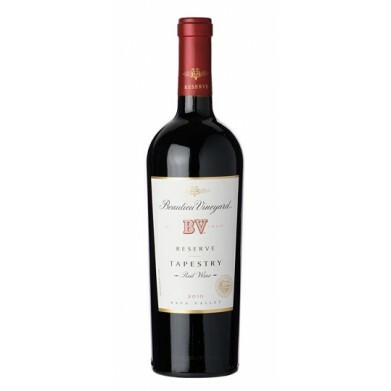 The deep ruby/purple-tinged 2010 Tapestry Reserve, a Bordeaux blend of Cabernet Sauvignon, Merlot, Cabernet Franc, Malbec and Petit Verdot, is earthy and spicy displaying hints of herbs, underbrush, sweet black currants and oak in the background. It is a medium-bodied, elegant 2010 to drink over the next 10-12 years.